Spiriferids are easy to identify. They often have an extended hinge line so wide they look winged. Other prominent characters are the fold and the sulcus that you can see in the middle of the spiriferids shown here. The feature that gives the spiriferids their name ("spiral-bearers") is the internal support for the lophophore; this support, which is often preserved in fossils, is a thin strip of calcareous material that is typically coiled tightly within the shell. 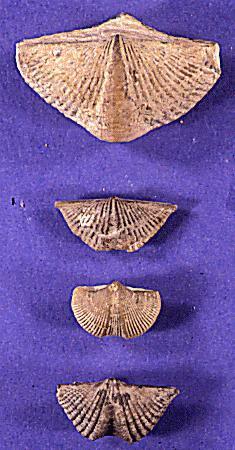 Fossil spiriferids first appear in the Ordovician period, as illustrated in the fossil range chart for brachiopods. They were extremely diverse during the Devonian period and later went extinct during the Jurassic period. Some fossil brachiopods make spectacular finds, like this one preserved as pyrite (fools gold).